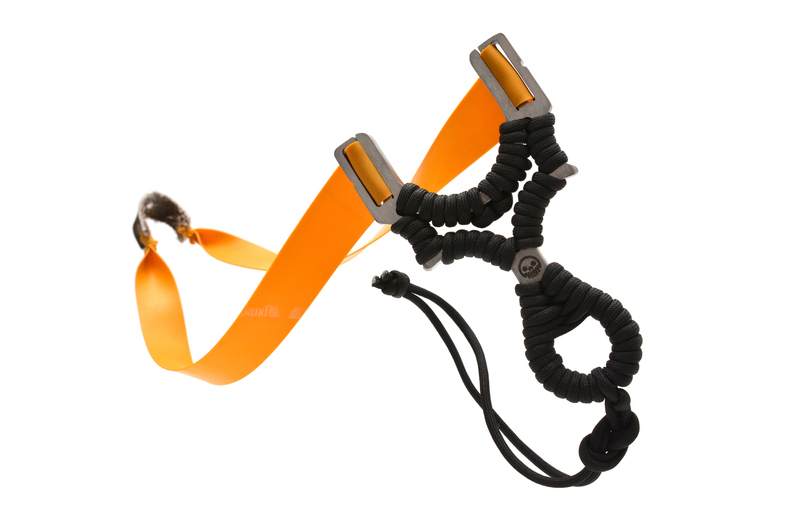 Ever since we got really obsessed about slingshots, we found there is a clear distinction between styles of slingshot designs and their band/tube attachment methods. Traditional Chinese style slingshot are typically manufactured from stainless steel and often have holes at the top of the forks for the ultra thin rubber tubing. 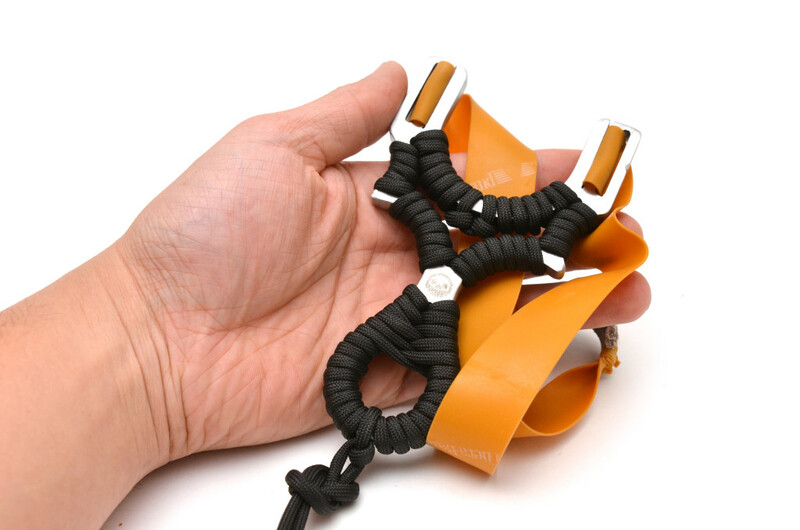 Chinese slingshots are typically smaller, wrapped with cord and nest in the hand very well. 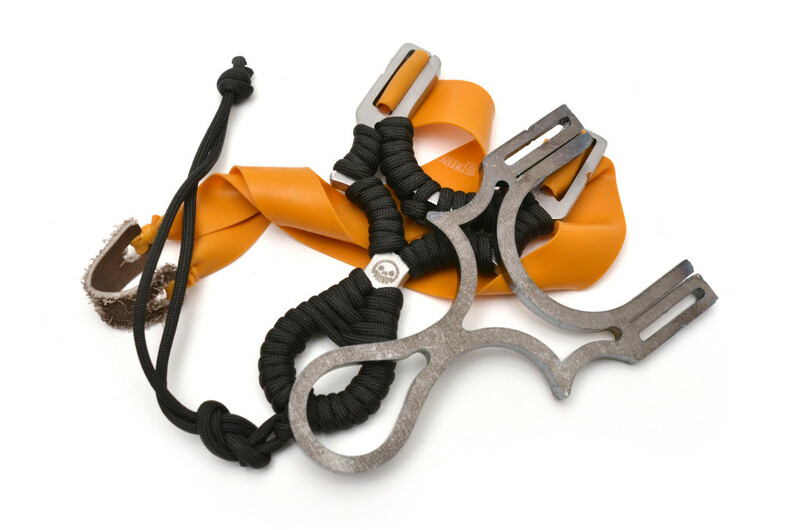 Western style slingshots are made from any kind of materials, but they are often held in a hammer grip. 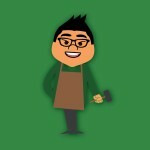 Although some Chinese style can accommodate flat bands, they don’t do it well. Why Skeluchin? 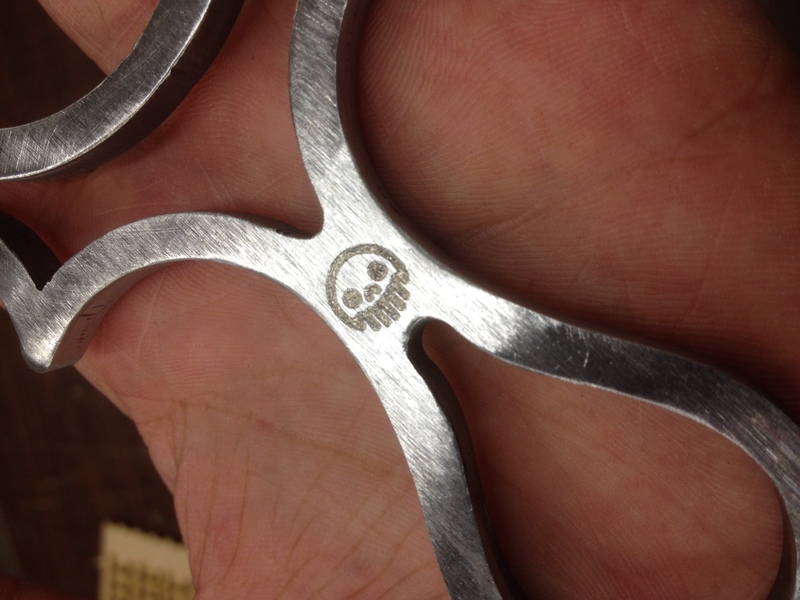 The design is derived from our Capuchin FB design and this frame is skeletonized. 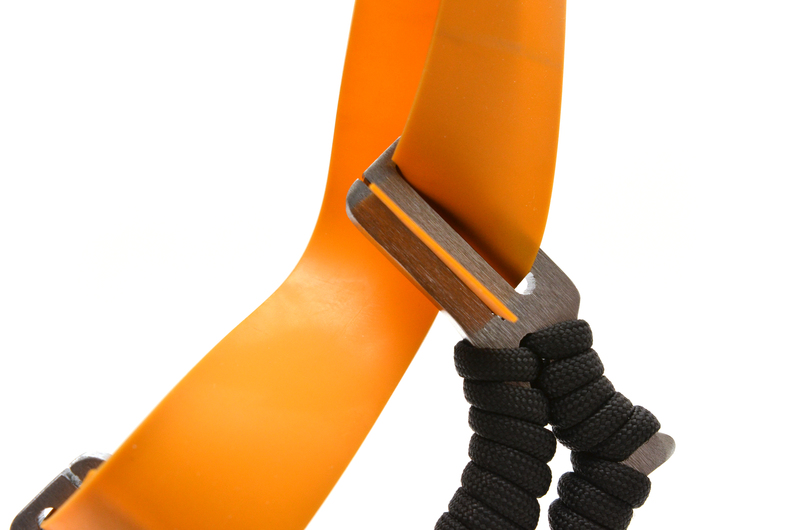 This Skeluchin prototype is made from laser cut, 1/4″ steel to mimic the Chinese sling style. The biggest difference is that the design uses our band slot/guide system to not adapt flat bands but full integrates the whole thing. Here you can see the raw frame, straight from the shop, behind it the finished product, the laser leaves an undesirable jagged edge that needed a lot of grinding, finishing and sanding to make work. Perhaps water jet or wire EDM cutting (this is how the Chinese slingshots are made). 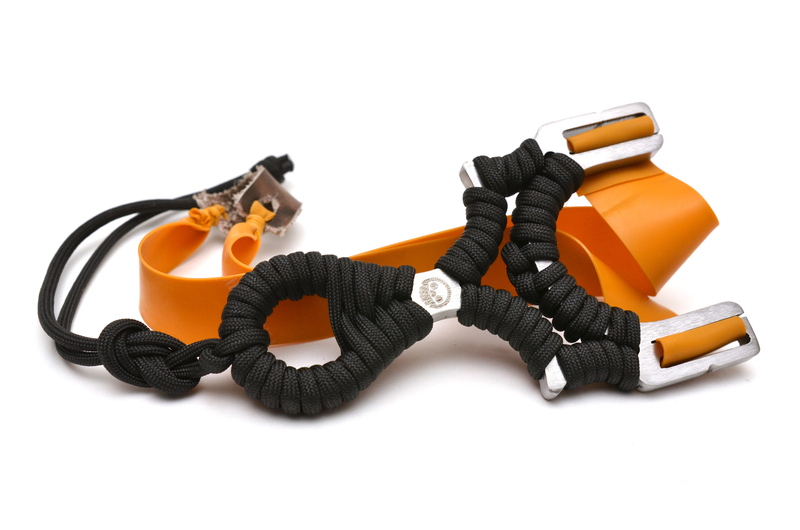 Over 10 feet of paracord was used to fully wrap the frame to make the sharp corners of the steel more comfortable to hold. 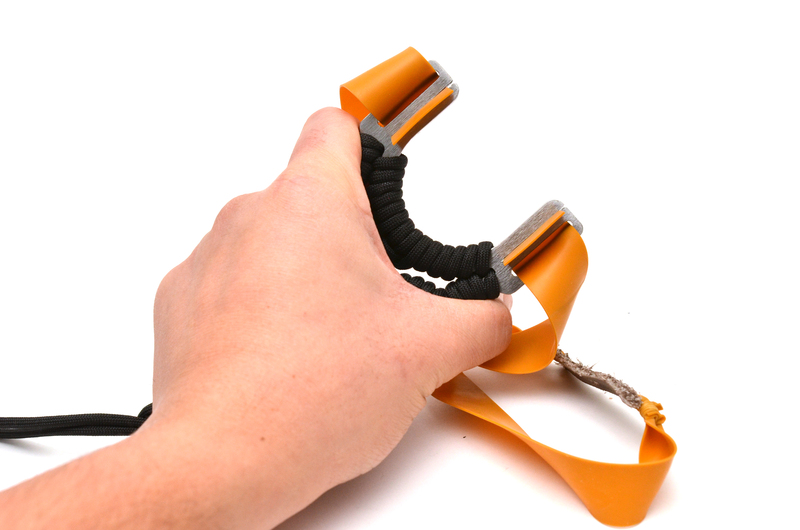 In the style of Chinese slingshots, the Skeluchin is held in a choke grip or in the finger thumb brace. We use a 150 watt CO2 laser to cut our wood slingshots but it also makes for a great engraver for steel. Throwing the sanded frame into the laser bed, the Metro Grade Skulthulu Maker Mark into the middle of frame. Nice sling. Do you have these for sale? The design needs a lot more work! This design had too many problems with manufacturing and finishing and the tube attachments on the inside of the yoke where too close together. Expect something LIKE it eventually.